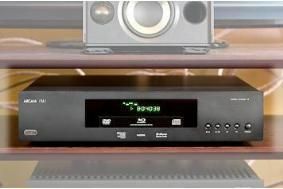 MANCHESTER SHOW 2010: World launch of Arcam FMJ BDP100 Blu-ray player | What Hi-Fi? Arcam's long-awaited BDP100 Blu-ray player finally gets its world launch at the Manchester Home Entertainment Show today. The £1000 player had originally been due on sale in August, but has suffered several delays in its development. An optional 3D upgrade will be offered next year. Our photographer is busy snapping away in the Arcam room right now, so we'll bring you more pictures of the player in our show picture blog later today. And if you can make it to the Manchester Home Entertainment Show this weekend you can save a whopping £555 on the FMJ BDP100 Blu-ray player when bought with its AVR500 multichannel receiver, normally £3554.90 together but available at the show for £2999.95. This and many more hot deals are available for this weekend only. Check out our news story for more big hi-fi and home cinema savings. This is Arcam's new BDP100 Blu-ray player, on sale late next month at £1000. Part of the FMJ range, and available in either black or silver, the player is Arcam's first foray into Blu-ray, and it's planned that an optional 3D upgrade path will be offered next year. The company says the machine offers very fast disc-loading – way faster than Denon or Pioneer, the company says – and very quiet and stable high-definition video. But most of all Arcam claims the BDP100 is designed to get the best from CDs as well as Blu-ray and DVD software. It uses high-quality 24-bit digital-to-analogue conversion from Wolfson, coupled with a linear phase Bessel filter, and high-precision re-clocking of data from the main decoder, resulting in reduced jitter.